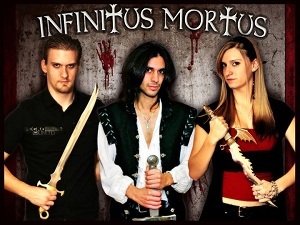 Infinitus Mortus are a symphonic metal band from New Jersey, USA. The band was founded in 2008 by Stephen "Stoki" Megna, as a studio project, and after recruiting a singer the first album was released in 2010 (with the confusing title of "2012"). Now they're back with their second album - The conspiracy of love. On looking at the band lineup and seeing two singers, one male and one female (they're brother and sister), I'd initially assumed this would be following the standard beauty and the beast formula - clean female vocals plus growling male vocals, but happily they've chosen not to do what so many other bands have done and instead have clean vocals from both male and female singers. Caitlin has a great voice and her vocals work well with both the music and the vocals of her brother. There are some very nice piano parts on this album which work very well and help the music stand out from some of the competition. The guitars sound good, but the drums really seem to be lacking in power and bass - this is really obvious in opening track "Heart of stone", and this does detract from the impact of the songs - with better drum sounds the album would have more punch to it. It's a very good album that's well worth a listen.